Children collect feathers from the lake at Jells Park. Photo: Joe Armao. Using equipment similar to an x-ray machine, the scanned feathers will help identify the bird species and reveal information about its diet, where it’s been and how healthy its habitat is. Ultimately, it will create a map of waterbird populations around Australia. “The aim is to improve our conservation of both wetlands and waterbird populations [which are] being hit pretty hard at the moment,” says Dr Kate Brandis, leading the joint project between the University of NSW and the Australian Nuclear Science and Technology Organisation (ANSTO). 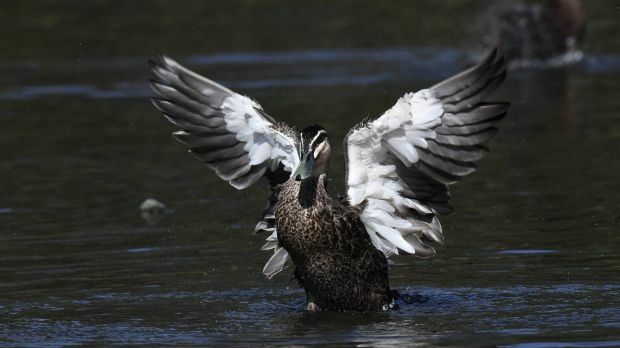 A Pacific Black duck. Photo: Joe Armao. “Feathers are made of keratin, the same as your hair and nails,” explained Dr Brandis of the scanning process. Dr Brandis has been researching colonial waterbirds – those that flock in great numbers to breed in wetlands when conditions are good – for the past 15 years. She hopes the Feather Map will not only solve the ongoing mystery of where these birds come from and go to but also determine which wetlands are crucially important for particular species. Armed with this knowledge it will be possible to improve management of important wetlands by providing adequate allocations of water, she says. At Jells Park, commonly seensighted waterfowl include Pacific Black Ducks, Australasian Darters and Little Black Cormorants. You might also see regular visitor and Mount Waverley local Graeme Hosken, 77, who says he became hooked on birds at age 14, after receiving a second-hand copy of the ornithological bible What Bird Is That?. “I opened it and inside was a little cutting from a newspaper and it said: ‘If there weren’t any birds the world would be overrun by insects in a year’. Hosken has since been involved in bird-watching competitions, conducted survey work to preserve wetlands and joined clubs including Birdlife Australia and its local branch, Birdlife Melbourne. Meanwhile, the project has negotiated special licences to make it legal to collect feathers from the ground and send them in to the Feather Map of Australia project. The researchers are also asking people to include a tag on each feather with the date, species (if known) and GPS location where it was found. This story was originally published in the Saturday Age, March 31, 2016.